Well folks, today (yesterday) is a somewhat sad day. It’s official: Microsoft has acquired GitHub. I’m not going to write a post bashing Microsoft; if you want to see the (probably valid) bashing, it can be found strewn about the internet. However, I just wanted to say that I am quite disappointed by this news. GitHub is a great platform that I’ve been using for years, and, the thought of Microsoft being in charge of it puts a bad taste in my mouth. Microsoft has a history of acquiring companies and then doing nothing with them, letting them die, or even ruining them. I sincerely hope that this doesn’t happen to GitHub. However, whatever Microsoft is going to do with GitHub, I don’t intend to be a part of it. Anyway. Good luck GitHub, sorry to see this happen. UPDATE: Today is June 6th, 2018. 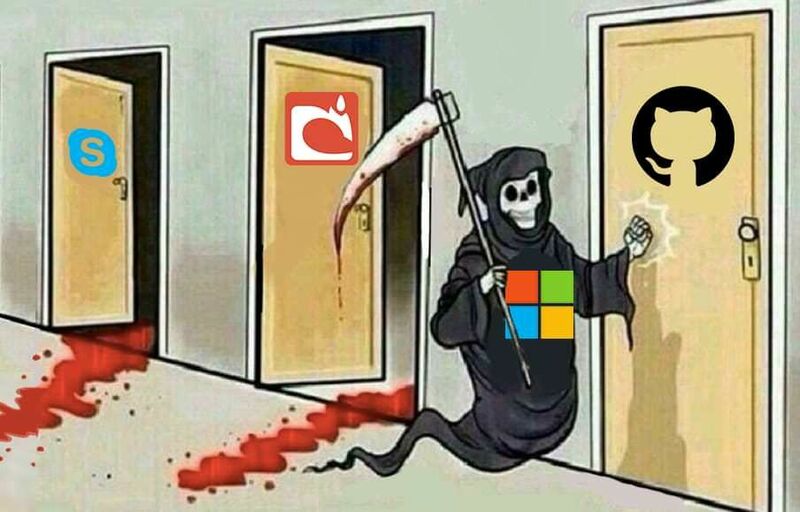 A few days after Microsoft signed GitHub’s death certificate. I just had to update this post because things have already gotten ridiculous. First of all, Satya Nadella is apparently the “number one” developer, according to GitHub Trending even though his profile page reports that he has ONE contribution in the last year. That contribution happens to be “joining GitHub”. And yet he is number one. But what’s worse is that they have already started censorship! I am actually very shocked to see this; I thought they wouldn’t do anything this crazy. This repository was number one in GitHub trending before Microsoft stepped in. Even if the repository lost traction over the days, it should still at least show up in trending; it does not. It is nowhere to be found in trending. Microsoft has censored it; censored a repository that doesn’t break the terms of service. Looking back, I am very relieved that I jumped off that sinking ship. Things have gotten crazy much faster than I expected. Sad to see GitHub die.